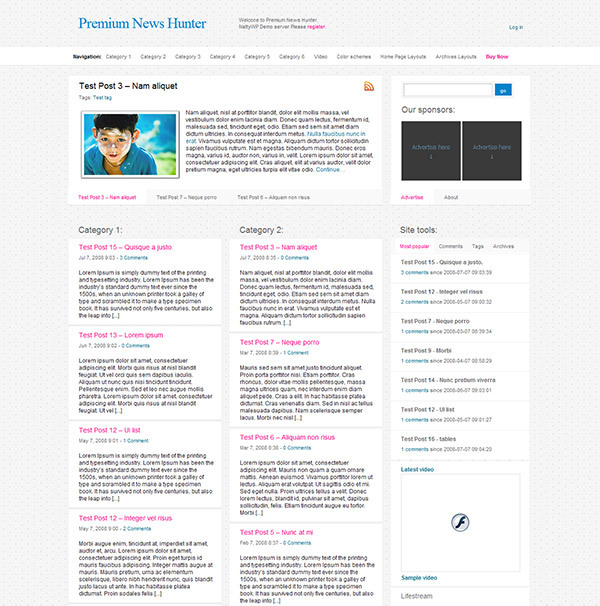 News Hunter is a new attractive theme for news websites. It was created as a perfect and clear news/magazine style and ready to present it, showing the wide range of offered facilities. 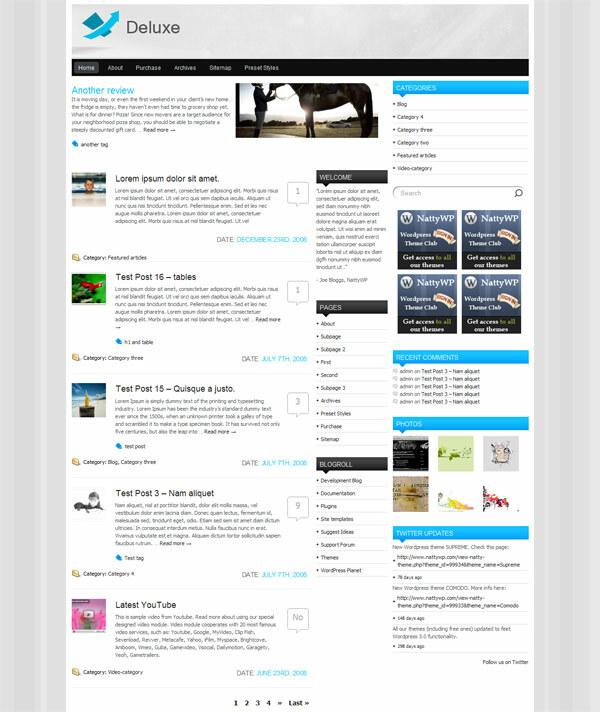 This is the best themes created with a very versatile layout. The versatility is kept by some powerful functionality including the all new News slide display system, category management and much more. Convenient admin interface allows fully customize the layout, as well as the functionality of separate modules topic. The topic functional can define different displays of news homepages, as well as pages of archives. That’s mean, that you can display news on the main page the following ways: creating two categories with two columns; one category and one column; designing one category but with two columns. The same actions you can use for archives. Attractive and dynamic JS modules (AJAX) make you site looks elegant and comfortable for users. There are 6 advanced color schemes. You can decide how to format articles by choosing one of the 3 different home page and 2 archive templates. News Hunter gives you an opportunity to display tags for news, as well as, display them, weighted by popularity, using WordPress tag system. News Hunter doesn’t contain images, everything renders via CSS. This makes News Hunter an incredibly fast, flexible and expandable theme. Customize it with just editing one single CSS file. This magazine style theme is perfect for all kinds of blogs. The modern and stylish design and blog structure can bring blogging to a new level. The theme has a built in custom admin interface that lets you change almost everything in the theme. Enable or disable elements, change or disable content sliders and so on. No HTML knowledge is needed to customize the theme. 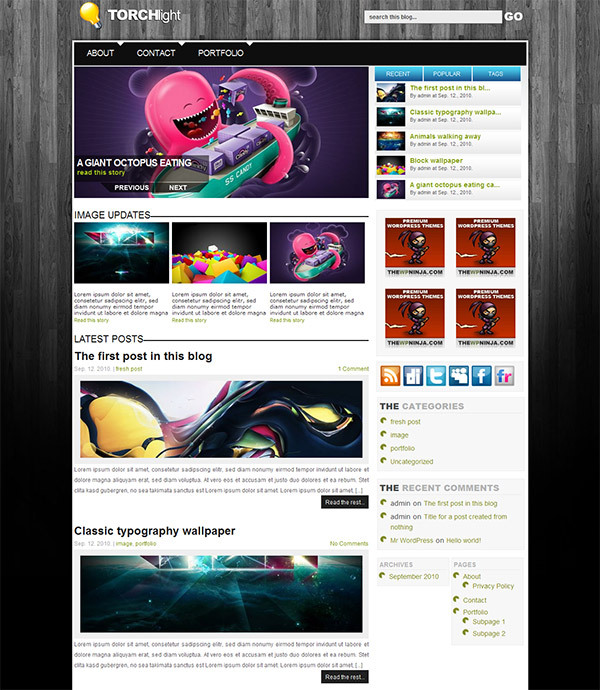 The theme was created with two sidebar sizes. This means you can choose which one you want to use: 300 pixels wide widgets, or half sized widgets (142px wide). This let’s you customize your blog even more. This theme has six different color styles that can be changed through the custom admin interface. All you need to do is choose a color style and save it. With the Torchlight Premium WordPress Theme: A modern and unique design, custom admin interface, complete installation and usage guide, built-in scripts, special script free menu, PSD logo source, single 300px wide sidebar widget space and two 140px wide sidebar widget space, built-in advertising options, content slider (can be disabled) with post listing function and a Google Analytics ready code.